Thanks for attending our third European Write the Docs conference in Prague! We’re so grateful to our attendees, speakers, volunteers and sponsors for making the conference possible. We hope you had a wonderful time, and that you are as excited as we are about the beautiful community that is forming. Below we’ve included all of the resources you might need for staying in touch. We also have a short anonymous survey for you to fill out, so we can keep improving the conference. Our three question anonymous survey is quick and easy, so go fill it out. This is the end of our 2016 round of conferences, but that doesn’t mean things are over! We’ll be having another North American and European conference next year. We’re always looking for folks who want help us organize events. We have worked to document the roles that are essential to running a great conference. We could use a few folks who are interested in lending a hand to make the event happen, so please let us know if that’s you! We also depend on sponsors to make our events as magical as they are, while keeping ticket prices low. 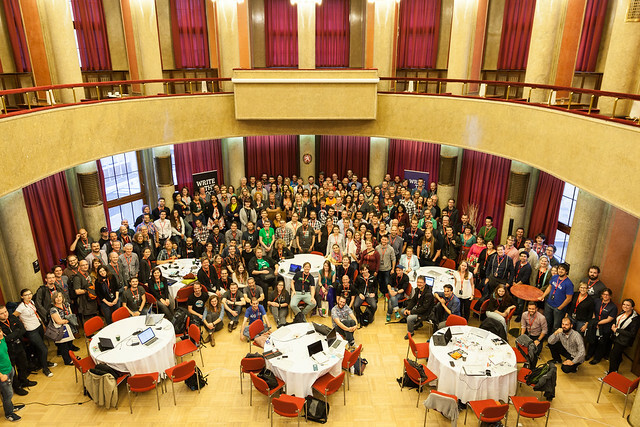 If you are curious about sponsoring Europe or North America next year, please contact us at sponsorship@writethedocs.org. It’s never too early to start thinking of your proposal ideas for next year. We’ll be opening our North American CFP in December, and Europe will be open in April next year. The official photos from the conference are now available. Thanks to Kay Smoljak for putting them together so quickly. They are licensed for non-commercial use with attribution, so feel free to use them in write-ups about the event. All the videos for the conference will be posted soon. We’ll send another update once they’re available! The Write the Docs Slack has really taken off this year! Our general Slack channel has been extra busy in the days and weeks leading up to the conference, and we hope that y’all continue the conversations throughout the year. Join our slack channel, or sign back in if you’re already a member! We hope you continue to build the community and keep in touch with other documentarians in your hometown. In this spirit, we have a number of meetups in cities across the world. If you don’t see your city listed, consider starting a meetup! The conference is possible only because folks like you make it a great experience. Thanks for making it another wonderful year. We hope to see you back again next year, or even sooner at one of our regular local meetups.